January thaw. The garden beckons. Spring is coming. I’m buying seeds to suit my garden dreams. Gardens have a finite size. No matter how many books come out about squeezing more plants into less space, the only way to have more space is to make a bigger garden. Bigger gardens mean more work. Mine is big enough. 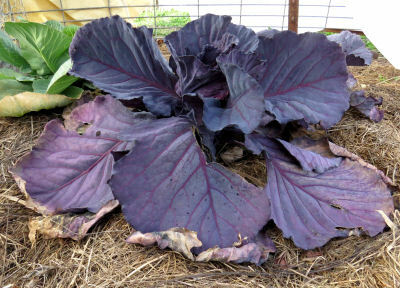 Red cabbage is unusual in my garden. I think it will show up more often in the fall since it is more frost hardy than the green cabbage. These will be gone by March. Peas will move in by the end of March. Maybe some spring cabbage. Maybe lettuce. Choices, choices. So many seeds to choose from. Rationally I should calmly assess how last year’s garden worked. What grew well? What did we eat? What did we like? What was a waste of time? Buying seeds is not done rationally. Not by me. Well, a little. The catalogs make everything look fantastic. Those gorgeous vegetables look delicious. We love corn. Corn takes lots of room. Raccoons love corn. I don’t grow corn. What will grow here? Last year Chinese Winter Melon spread its vines down the section between okra plants. Maybe Yukon gold potatoes will grow here this year. The pathway is full of dead nettle and chickweed for the spring bees. That will disappear under mulch in late April. Winter squash is wonderful. I love growing pumpkins. Both take lots of room. How many can two people eat? The goats don’t mind eating the extra. My diet needs more greens in it. Not everyone in the household agrees. However, I have friends who love the extras. Rutabaga is one vegetable I rarely have any luck with. I love this root crop. It hates the Ozarks. I persist. Spinach, snow peas and peas are on the early list. Yard long beans are on the later list. Potatoes are definitely on the list. They grow so well. I do plant fewer as we can’t eat them all. 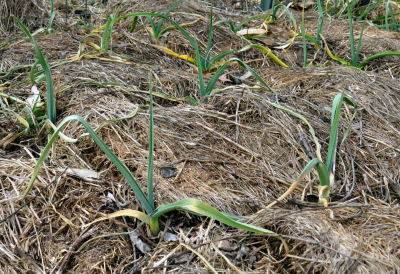 All winter the garlic has settled in under the mulch. This is one crop planted in the fall as spring garlic gets burned by summer heat in the Ozarks. Four summer staples are on the list. Okra, summer squash, sweet peppers –both colored bell and long ones – and tomatoes will be in the garden. I always seem to end up with many more plants than planned for. Buying seeds is such fun. Garden dreams are so wonderful. Reality sets in about June. By then it’s too late for rationality. The garden will again become a jungle, a delicious jungle, a frustrating jungle. And I will do it again next year. This entry was posted in High Reaches and tagged choosing garden seeds, garden planning, Ozark gardening on February 6, 2019 by [email protected]. Two inches of snow, not much but enough to dampen any gardening enthusiasm. It should be looked on as a chance to do some garden planning. I grew up enjoying outings at a favorite Chinese restaurant. Chinese cuisine is heavily laced with vegetables. At least it was at that time. American cuisine is heavily dependent on meat. I prefer the vegetable approach. Good vegetables are hard to find. No, you say, go to the store. In my area the vegetable selection is limited and expensive. Commercial fruits and vegetables are often picked green so they will ship well. The difference between a store tomato and one ripened in the garden is a case in point. Garden planning has three parts. The indoor part is deciding which vegetables will be in the garden this year. Then the seeds are located in the seed catalogs, ordered and stockpiled until planting time. The outdoor part begins with choosing a garden site and continues from then onward. I have the garden laid out, fenced but not quite ready for spring. 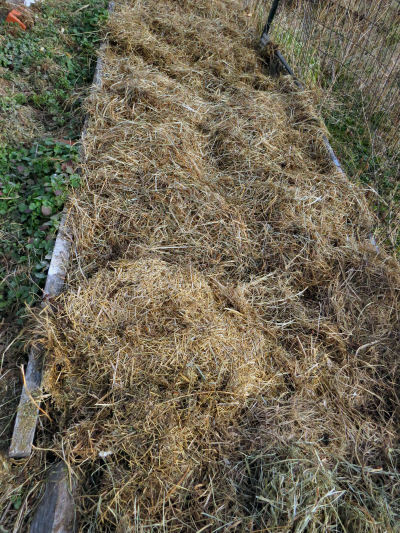 Usually all my beds are manured and mulched long before now but late frost delayed starting. There are three beds to go but they are planted later. For several years I have been adding a few Chinese vegetables to the garden. I would like to add more but am not familiar with what they are or how to grow them. 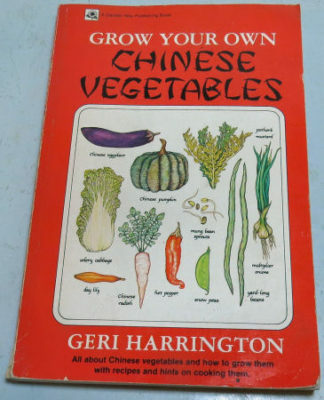 Grow Your Own Chinese Vegetables by Geri Harrington, Garden way Press, 1978, is easy to read, has lots of interesting tips, goes through many Chinese vegetables with what they are, how to grow them and how to use them. The third part of garden planning is reading. Many gardening books have much the same information in them. That is when scanning comes in handy. Scanning is a fancy way of saying reading a sentence each paragraph to see if the paragraph is worth the time. Surprisingly these books with so much repetition of information often toss in a nugget or two that make the reading well worththe time. Many times that nugget may be applied to gardens very different than mine but still solve a problem I have. This year I am perusing an older book, 1978 from Garden Way Publishing, called Grow Your Own Chinese Vegetables by Geri Harrington. Much of the books is a listing of individual vegetables: what they are; how to grow them; what they look like; and how to use them. These pages I will read on a selected basis as there are a number of Chinese vegetables such as hot peppers I will not ever grow. One nugget came in the first few pages. Consider soil. My father used to go out with a shovel and turn his garden. Grow Your Own Chinese Vegetables has an interesting observation. Vegetables grow in topsoil which sits on top of the subsoil. Often this topsoil is thin or even missing. Subsoil may be turning into soil but naturally takes hundreds of years to do so. Turning your soil with a shovel could bury your topsoil into the subsoil defeating your garden before you plant your seeds. Check for how deep your topsoil is before turning your garden over. Turning subsoil into topsoil can be speeded up. Remove the layer of topsoil. Dig manure and thin leaves such as maple or sweet gum into the subsoil. Replace the topsoil. Doing this for a few years will make a deep layer of topsoil. Don’t neglect adding compost to the topsoil to keep it in good shape. I just started this book and within a few pages found a nugget of information I hadn’t read elsewhere. I found some others in the pages on snow peas and yard long beans, both of which I grow. Winter is a great time for garden planning. In a way winter is too short. I need to start my cabbage seeds by the end of the month. So much for loafing. This entry was posted in High Reaches and tagged Chinese vegetables, garden planning, gardening, Grow Your Own Chinese Vegetables on January 11, 2017 by [email protected].